Mahendra Guru December 17, 2018 Important Reasoning Questions For IBPS Clerk, Reasoning Ability For IBPS Clerk, reasoning questions. As IBPS has released the official notification of the Common Recruitment Process for selection of personnel for Clerical cadre Posts and the exam is tentatively scheduled to be held December 2018 & January 2019. Looking at the notification, we have now started subject-wise quizzes for the exam. It will include quizzes of all the subjects- Quantitative Aptitude, English, Reasoning and Computer. All these quizzes will be strictly based on the latest pattern of the IBPS Clerk exam and will be beneficial for your preparations. So, keep following the quizzes which will provide you a set of 10 questions daily. 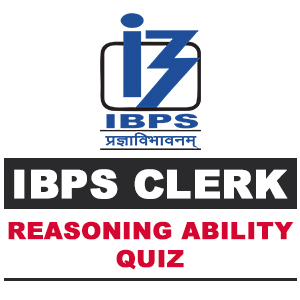 Here, we are providing you important questions of Reasoning Ability for IBPS Clerk 2018 exam. Q1-5. Study the following information carefully and answer the questions given below. A building has seven floors numbered one to seven, in such a way that the ground floor is numbered one; the floor above it is numbered two and so on such that the topmost floor numbered seven. One out of seven people viz. P, Q, R, S, T, U and V lives on each floor. The person who has even place value according to alphabet series, lives on fifth floor. T does not live on the floor immediately below U’s floor. U lives on the second or seventh floor. R does not live on an even numbered floor. Q lives on floor immediately above or below R’s floor who does not live on seventh floor. S does not live on the second topmost floor. There are two persons live between P and S and three persons live between Q and T.
Q-1. Who lives on topmost floor? सर्वोच्च मंजिल पर कौन रहता है? Q-2. Who lives immediately above P's floor? कौन P की मंजिल के ठीक ऊपर रहता है? Q-3. What is definitely true regarding T? T के सन्दर्भ में निश्चित रूप से क्या सत्य है? Q-4. Who lives between U and P? U और P के बीच कौन रहता है? Q-5. Four of the following five are alike in a certain way and so form a group. Which is the one that does not belong to that group? निम्नलिखित पांच में से चार एक निश्चित तरीके से एक समान है और इसलिए एक समूह बनाते है।वह एक कौन सा है जो उस समूह से संबंधित नहीं हैं? Seven members P, Q, R, S, T, V and W are sitting around a circular table and facing towards the centre. There are three female members in the family and they are not neighbour to each other. Each of them likes to plants of different sapling i.e. Sandal, Guava, Banana, Lemongrass, Teak, Night Jasmine and Bougainvillea but not necessarily in the same order. Night Jasmine is planted by a female. Bougainvillea is not planted by P.Q, who likes to plant Banana, is not the neighbour of S. R is second to the left of W and fourth to the right of T. Q, P and V are not females. Girl S, who likes to plant Guava, is not a neighbour of R and T. V, who likes to plant Lemongrass, is not a neighbour of R. The one who likes to plant Teak is fourth to the right of male T.
Q-6. Who is neighbour of W and which plant is planted by him? W का पड़ोसी कौन है और उसके द्वारा कौन-सा पौधा लगाया जाता है? Q-7. Who is fourth to the right of V and which plant is planted by him? V के दायें चौथा कौन है और उसके द्वारा कौन-सा पौधा लगाया जाता है? Q-8. Which of the following represents the male members of the family? निम्न में से कौन-सा परिवार के पुरूष सदस्यों को दर्शाता है? Q-9. How many persons sit between W and the one who likes to plant Sandal? W और वह एक जो चंदन का पौधा लगाना पसंद करता है के बीच कितने व्यक्ति बैठे है? Q-10. Which plant is planted by the person who sits between T and S? वह व्यक्ति कौन-सा पौधा लगाता है जो T और S के बीच बैठा है?